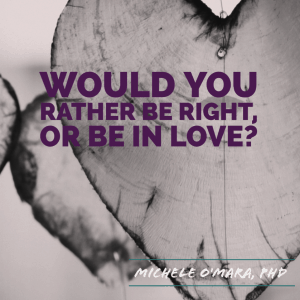 In one of my Couple’s workshops, I had a couple share with me that when they found themselves in battle over something small, one of them would interrupt the argument with the question: “Would you rather be right, or in love?” I thought this was great fodder to add to my lesbian love guide – 52 Strategies for a Happy Relationship. There are a million-and-one ways to achieve the same outcome. How you clean the house, for example, might be very different than how your partner cleans the house. Maybe you like to do it all at once. Perhaps your partner takes it a day at a time, bathrooms one day, dusting the next, windows the day after that, etc. until the cycle starts again. Is one way the right way? If you think so, think again. Whenever two people from entirely different backgrounds, with very different life histories and experiences, partner and hold tightly to THEIR WAY, you can bet there’s going to be a struggle. When the focus remains on the outcome and not our ego, or how we want things to evolve, we are able to achieve far more in life and love. Outcome, Not Ego. That my friends, is Tip #21 from the Lesbian Love Guide. If you have missed the first 20 strategies and suggestions for happy lesbian relationships, you can catch up here. I welcome your comments, and even your own tips and strategies that you would add to these.